Pancreatic cancer is at least four separate diseases each with a different cause and needing a different treatment, scientists have discovered. The researchers say the knowledge will lead to new drugs targeting the Achilles' heel of each patient's cancer and that they have already seen some "exceptional" results. Cancer charities said the findings were "incredibly exciting". 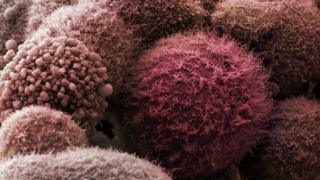 The analysis, published in the journal Nature, looked at 456 patients' cancer. Tumours are caused by mutations in DNA that make healthy tissue turn cancerous - but there is more than one way to make a cancer. One example of how different the cancers are is the average survival time from diagnosis with squamous-type cancers was just four months - roughly half that of the other types. But crucially, the knowledge could lead to new treatments. Dr Andrew Biankin, one of the researchers at the University of Glasgow, told the BBC News website: "This is the most comprehensive analysis of the blueprint of pancreatic cancer. "So this knowledge reveals what makes these cancers tick and which ones may be vulnerable to particular treatments by defining the Achilles' heel of every cancer." It would be a much needed breakthrough for a type of cancer stubbornly difficult to treat. Most people diagnosed with pancreatic cancer are told they have less than a year to live. And just 1% of them are alive 10 years after being diagnosed - a survival rate unchanged for four decades. Meanwhile, dramatic improvements in breast, prostate and colon cancer care mean pancreatic tumours are predicted to kill more people than any other cancer, apart from lung, in some countries. "It's just a really tough cancer," Dr Biankin said. But he hopes matching drugs to specific errors in tumours will help patients. He said: "The fact that we see, through chance, that some patients respond exceptionally to a particular therapy allows us to expand these insights so we can treat more patients with similar cancers at a genetic level." It is thought the "immunogenic" pancreatic cancers may be vulnerable to a new wave of immunotherapies already transforming cancer, and clinical trials are already under way. Leanne Reynolds, the head of research at Pancreatic Cancer UK, said: "The findings of this research are incredibly exciting for anyone affected by pancreatic cancer, as they should mean that in the future the right patients can be given the right treatment at the right time. "If we can predict more accurately which treatment would be most effective for each patient, we can ensure patients have the best chance of living for as long as possible, as well as possible." Dr Emma Smith, from Cancer Research UK, said: "Identifying different types of pancreatic cancer and revealing the disease's complexity is an important step towards finding more effective treatments. "This will help to ensure patients are given the therapies that are most likely to help."